We’d love your help. Let us know what’s wrong with this preview of Dragon Drive Vol. 9 by Ken-ichi Sakura. Reiji thinks he’s no good at anything – especially schoolwork! Then one day he’s introduced to a game called Dragon Drive and gets his very own virtual dragon named Chibi. Small and weak Chibi appears to be as big a loser as Reiji! But after their first battle, Reiji realizes there may be more to his tiny friend than meets the eye. 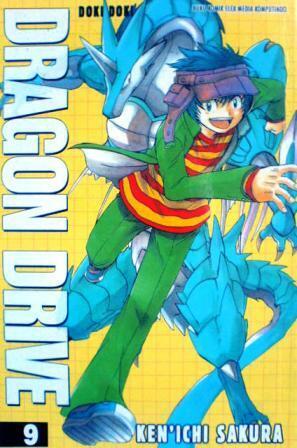 To ask other readers questions about Dragon Drive Vol. 9, please sign up. Takumi was really starting to enjoy the exciting game of DRAGON DRIVE, even winning a few fights - but a hacker enters the program and begins merging the video game with realty! Sakura amps up the shock and action with this exciting entry. Who can Takumi turn to when his two worlds begin to mix and blend?! Also known as Ken'ichi Sakura. Ken-ichi Sakura made his debut in Monthly Shonen Jump with the manga Fabre Tanteiki, which was in 2000. He began Dragon Drive in the March 2001 issue of Monthly Shonen Jump, which went on to be a successful anime and even bred its own video games. His latest work, Kotokuri, began running in March 2006's volume in Monthly Shonen Jump.